Abundance and Distribution One of the HMMC’s main research goals is to conduct standardized shore-based counts of humpback whales in Kawaihae Bay from shore in the peak of the whale season (February and early March). The goal is to document the presence and relative position of all marine mammals, vessels and aircraft to describe and understand trends in the whale population and human use. We are currently completing a scientific manuscript on trends in the relative distribution and abundance of humpback whales in Kawaihae Bay since 1988. In December 2005 at the Sixteenth Biennial Conference of the Society for Marine Mammalogy in San Diego, we presented a poster titled: Using compass and reticle binoculars to measure animal position: An evaluation and comparison to theodolite data, which is based on data from our shore station work. Whale song – Male humpback whale song is one of the most complex vocalizations in the animal kingdom, and yet scientists still aren’t quite sure why they do it. Our working hypothesis is that one way that females choose a mate is by evaluating male singers based on the acoustic qualities of their song. With help from the Norcross Wildlife Foundation we began investigating whether the songs from larger males are different than those of smaller males. Measuring the differences in song is the easy part; using computer things like song length and frequency composition are detectable. Measuring whale size is another matter; estimating whale size based on the size of their flukes – fluke photogrammetry – proved to be quite difficult. Future studies, pending funding, are planned using aerial photogrammetry to compare the size of the whole whale. To hear a 5-minute clip of humpback whale song recorded in 2016, visit our Audio Gallery. Did you know that whale song is often heard in the fall in Alaska? Skin condition and health assessment – In the early 2000s, humpback whale researchers began to notice the increasing occurrence of “nodular dermatitis” (a.k.a. bumps) of unknown origin on humpback whale flanks. The bumps persist from year to year, and some whales have many of them. A biopsy sample from a bump taken in 2006 indicated that the tissue had indications similar to an allergic reaction. In 2013, HMMC began collecting skin and blubber biopsy samples in collaboration with the Hollings Marine Laboratory of the National Institute of Standards and Technology in Charleston, SC to determine if trace element levels in the skin are different between whales with or without bumps. Levels of organic pollutants like PCBs and flame retardants in the blubber from these samples are being analyzed by scientists at the National Marine Fisheries Service Montlake Laboratory. Preliminary results suggest that bumpy whales may differ from non-bumpy in levels of a few trace elements. In the future, HMMC plans to continue to look into overall whale health and investigate potential viral and bacterial causes of bumps, which so far have been difficult to confirm or to rule out. Whale behavior and mating system – Despite researchers spending countless hours observing humpback whales on their breeding grounds around the world, mating has never been scientifically documented. We are intrigued by pairs of whales that stay in one place and dive for a long time (15 minutes or more). If the dyad is composed of a male and a female, we suspected that they might be mating pairs. Since it is difficult to tell male and female whales apart visually, we collected biopsy samples that were genetically analyzed by the Cetacean Conservation Genomics Laboratory at Oregon State University to determine the sexes of these long diving dyads. Our suspicions were confirmed, in that many of these were male-female pairs. Did you know that humpback whales can hold their breath for over 30 minutes? Whale hormone studies – Basic research on the level of reproductive hormones (testosterone, progesterone, estrogen, cortisol) has the potential to reveal new discoveries about pregnancy, stress and a host of over questions. HMMC is working with the College of Fisheries and Ocean Sciences and others to develop a humpback whale pregnancy test that uses progesterone levels in blubber biopsy samples with sighting histories of females known to be with or without a calf the following year. The results are promising but still pending. Did you know that female humpback whales in the North Pacific typically have their first calf by age 13 and subsequently give birth to a calf every 2 to 3 years? SPLASH – In 2004-2006, HMMC participated in SPLASH, which stands for Structure of Populations, Levels of Abundance and Status of Humpbacks. This was an unprecedented international collaborative study that spanned the North Pacific. Researchers on all the main Hawaiian Islands, as well as the U.S. West Coast, Japan, Mexico, Central America, the Philippines, Russia and Canada simultaneously collected humpback whale data. 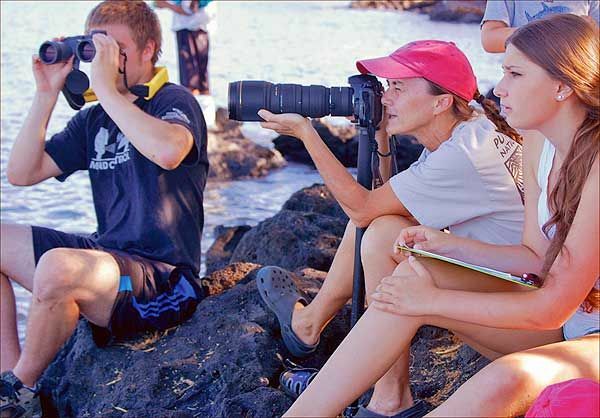 With help from our dedicated volunteers, over the course of three winters, HMMC conducted 86 surveys off the Big Island which resulted in fluke photographs from about 750 whales. We also collected over 400 biopsy and sloughed-skin tissue samples. This study found that the entire North Pacific population numbered between 18,000 and 21,000, with over 50% wintering in Hawai‘i. Most of the Hawaiian humpback were relighted in Southeast Alaska and the Gulf of Alaska. More details can be found in the Final Report. Did you know that when they breach, whales shed small flakes of skin that can be used to learn about the genetics and feeding habits of that whale? 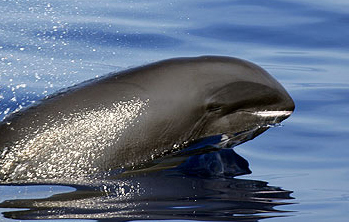 HMMC periodically conducts informal offshore surveys to find deepwater dolphins, such as offshore spotted dolphins (Stenella attenuata), bottlenose dolphins (Tursiops truncatus), false killer whales (Pseudorca crassidens), pygmy killer whales (Feresa attenuata) and melon-headed whales (Peponocephala electra). 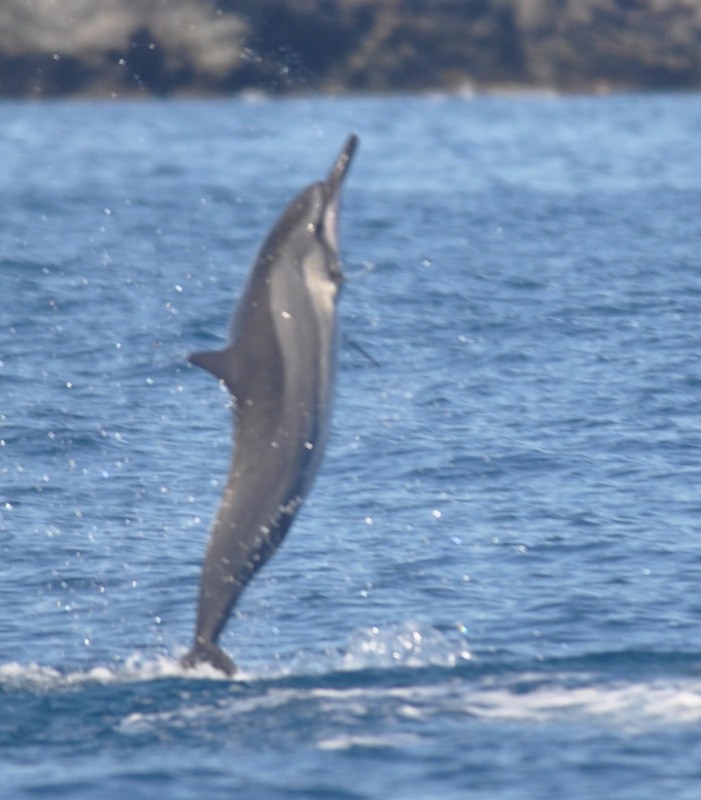 Images from the survey are sent to Dr. Robin Baird at the Cascadia Research Collective which maintains photo-identification catalogs of several species of odontocetes in Hawaiian waters. Individual identification photos allow researchers to determine how large the population is and the extent of inter-island movement. One of the species that HMMC photographs and studies is the 'Hawai‘i Island associated' melon-headed whale. Two populations of this species are found in the Hawaiian Islands. One population moves between the islands and is frequently found in deep water. The group that we more frequently encounter is found in shallower waters and is resident to Hawai‘i Island. On several occasions, we have seen melon-headed whales associating with humpback whales in deeper waters where we don't ordinarily encounter humpbacks. The nature of these associations is unknown, but the humpback whales are seen at the surface, slowly rolling and slapping their pectoral fins, with small groups of melon-headed whales around each humpback. At times, the humpbacks performed behaviors suggesting that the were agitated by the presence of the melon-headed whales. Pu‘ukoholā National Historical Site, a premier cultural attraction in West Hawai‘i and has long been known for its underwater shark temple, or “heiau” in the Hawaiian language. During a trip to Pu‘ukoholā with students from the University of Alaska Southeast in 2007, we saw many black-tipped reef sharks swimming in Pelekane Bay. Students had been learning how researchers identify individual humpback whales by their fluke markings. we wondered aloud if the patterns on the sharks’ dorsal fins could be used to identify individuals. We found out that shark fin patterns can be used to identify individuals! This led to HMMC starting a research program on the sharks of Pelekane Bay in cooperation with the National Park Service. So far, we’ve identified over 20 different black-tipped reef sharks in Pelekane Bay, and sometimes see as many as 15 sharks during a single 1-hour survey. Sometimes, other species of sharks are seen in the area as well. In the future, HMMC plans to publish a scientific paper documenting this research method and what we have found about patterns of shark use of Pelekane Bay. With funding from a National Park Service Challenge Cost Share Grant, HMMC designed a shark brochure and the Park’s wayside exhibit on sharks that is viewed by thousands of the Park’s annual visitors.